Sandra Grace Brooks has developed an extraordinary reputation for her effectiveness in facilitating the healing of her clients. 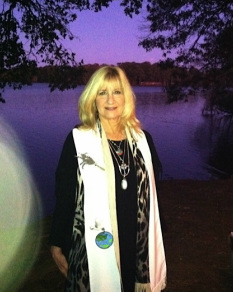 With her vast array of continually evolving approaches and techniques, Sandra Grace is able to access modalities and frequencies that are unique to each situation. Through her experience and inner guidance, she has been able to bring about profound transformations for those who seek her services. Sandra Grace works with people of all ages and backgrounds. Some clients are new to the concepts she deals with, others are skilled practitioners themselves who entrust her with their healing. She is especially gifted in working with the "New Children" - Indigo, Crystal, Rainbow and beyond! She has remarkable success in healing beloved pets that are in crisis. If you have been guided to this website, you may be someone who is ready for transformation. Please listen within to see if working with Sandra Grace resonates with you. You may not know why, just know that your highest good is calling! "Your vision will become clear only when you look into your heart. Learn how Sandra Grace can make a difference in your Life! As an intuitive energy healer and business coach, I am always looking for other world-class healers to assist me both in keeping my energy clear and in spiritually advancing. Of all the healers I have met while traveling around the world, I consider Sandra Grace to be one of the finest. She has faced and overcome many personal challenges, so she speaks from her experience. "She walks her talk!" Her gifts of "spiritual sight" and "knowing" allow her to see and know how to help those who come to her. I honor her as a gifted, strong, yet kind, compassionate, sincere person - and I honor her wonderful gifts, too. She is the real deal!